Adjacent to the university is a high-tech center, or research park, that is commonly referred to as Technopolis. Like the university, it has a very high profile in this part of the world. So, there are two vibrant R&D centers on the northern periphery of Oulu. Both feature regional development and an “applied” ethos as part of their institutional missions. Another regional resource, the airport—Oulun Lentoasema—is situated approximately 15 kilometers south and slightly to the west of the city center. The regional bus service, Koskilinjat Oy, recognizes the interdependence of city center, airport, and research park, with the #19 bus line. Still, it is curious that regular bus passes cannot be used for travel to or from the airport, and for some reason the #19 bus manages to skirt the central railway station, rautatieasema. Here is a modest proposal for the future, submitted with the brazen confidence of a stranger who knows next to nothing about how the region works economically and socially. But let’s assume that the projections for future growth hold up, and that Oulu becomes an ever more prominent node of development for the entire north of Finland. Let’s assume the persistence of widespread consensus on the value of retaining Oulu’s dense and vital urban core, which depends on public transport, and which in turn inhibits sprawl. Let’s assume, finally, what it might not be at all safe to assume, which is that the Baltic Sea will stay put instead of inundating the city and much of Ostrobothnia as a result of global warning. If that happens, of course, all bets are off. But assuming that it doesn’t happen…. It could be time for Oulu to start thinking about a tram line. A tram linking the various high-tech nodes of the region would logically begin at the airport and end at the Linnanmaa campus and research park. It could roughly follow the route of the #19 bus, north through the city center on Isokatu, and south on Torikatu, though ideally it would build in a little hiccup, on both northbound and southbound routes, to incorporate the railway station. 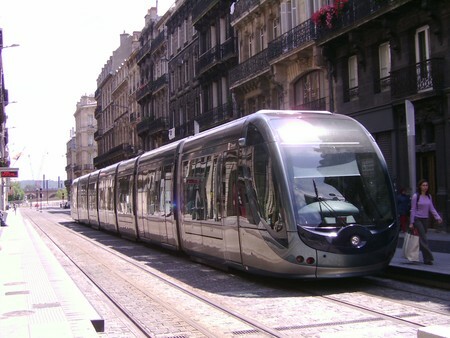 Outside the city center, the tram line could hug the main motorways, or it could exploit the fact that a very large amount of land currently is given over to bike trails and pedestrian paths. That would naturally generate NIMBY (Not in My Back Yard) appeals, of course. It would help if the tram line replaced only the #19 bus, and if existing buses continued to run through neighborhoods presently served. It would make sense if the tram had very few scheduled stops outside the city center. And that in turn would allow for some radical thinking about the optimal route. One can’t help but wonder, for example, what it would cost to build a tram causeway over the bay (Kempeleenlahti) that separates the city center from the airport at Oulunsalo. What a spectacular site that would be for a Santiago Calatrava suspension bridge! A Doubting Thomas might ask, What about those ugly overhead "streetcar" wires? Well, modern technology appears to be closing in on a solution that meets modern safety standards. It’s called a ground-level power supply, or APS. See the short article in Wikipedia here: http://en.wikipedia.org/wiki/Ground-level_power_supply. Or the longer piece here: http://web.archive.org/web/20041017010645/http:/www.lrta.org/dd011.html. A potential problem may be posed by all the snow that nature dumps on the north of Finland. It’s easy to imagine how that could play havoc with the ground-level current. All of the websites devoted to the subject are suspiciously silent on the subject, and Bordeaux, the poster child for APS (see photo above), enjoys a climate very different from Oulu’s. Does anyone out there in this corner of the blogosphere know how big a problem heavy snow would pose for a ground-level powered tram? The person who taught me about recycling asphalt, perhaps? Kiitos!